UPDATE: THIS DEAL ONLY WORKS IF YOU GOT THE CVS EMAIL YESTERDAY. I just got back from dinner with my hubby at Panera Bread. The two older boys are at VBS so we thought we'd enjoy dinner out in at a sit down restaurant together for a change. I just checked my email and guess what... CVS is offering a 12pk of Pepsi for $.99 tomorrow only (limit 1). 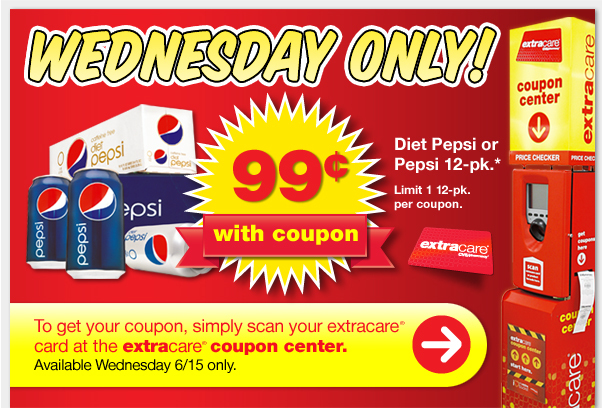 To get your coupon, simply scan your extracard at the coupon machine inside the store. What an good deal! CVS your the best! !